There were many highlights in the April 2016 Fine Art Sale held at St Edmunds Court, Okehampton Street, Exeter on 19th and 20th April 2016. Menerbes (FS30/280) by artist John Piper (1903-1992) realised £10,000 in our Two Day Fine Art Sale starting on 19th April 2016 at our salerooms in Exeter, Devon. In the jewellery auction, a sapphire and diamond lozenge shaped brooch (FS30/177) exceeded expectations selling for £3,900, whilst a Patek Philippe gentleman's 18ct gold 'Ellipse' automatic wristwatch (FS30/111) went under the hammer for £3,600 and a Hermes lady's 18ct white gold and diamond set H wristwatch (FS30/113) realised £3,500. 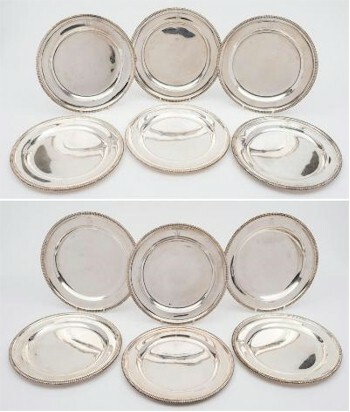 The highlight of the silver auction was a set of twelve George III silver dishes by the maker William Stroud, London and dated 1802. The coronet and crest were that of William Montagu, 5th Duke of Manchester (1768-1843). Weighing in at 200.90ozs, this beautiful set sold for £3,100. 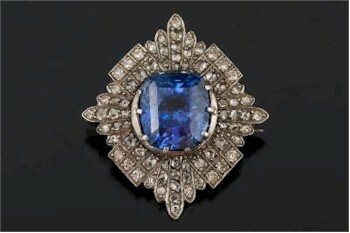 A sapphire and diamond lozenge shaped brooch (FS30/177) exceeded expectations, selling for £3,900. This Patek Philippe gentleman's 18ct gold 'Ellipse' automatic wristwatch (FS30/111) sold for £3,600 at the auction in Exeter. 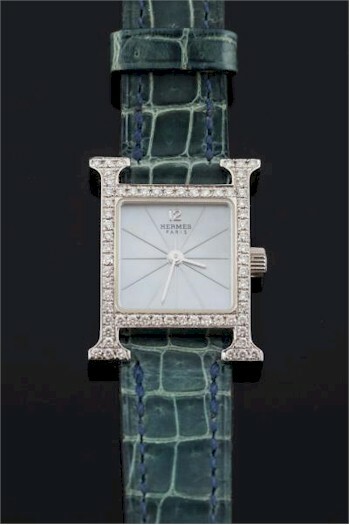 A Hermes lady's 18ct white gold and diamond set H wristwatch (FS30/113) realised £3,500. The highlight of the silver auction within the Fine Sale was a set of twelve George III silver dishes (FS30/78), bearing the coronet and crest of William Montagu, 5th Duke of Manchester (1768-1843). They sold for £3,100. In the picture auction, it was a Modern British painting that took centre stage. 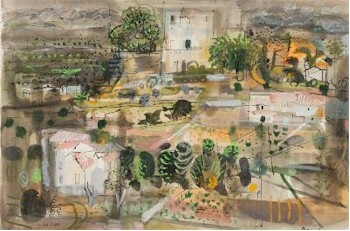 'Menerbes' by John Piper (1903-1992) (FS30/280) created a great deal of interest on both the telephones and the internet. The pen, ink and watercolour, signed bottom left, inscribed with title bottom right depicted Menerbes, a commune in the Vaucluse, South East France. After fierce telephone bidding it was sold for £10,000. In the same section of the sale, a Maxwell Ashby Armfield (1881-1972) tempera picture of Puerto de Soller, Mallorca (FS30/284) was again sought after and finally went under the hammer for £3,000. 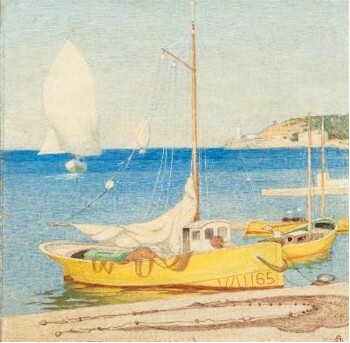 Peurto de Soller, Mallorca (FS30/284) by Maxwell Ashby Armfield (1881-1972) realised £3,000. The demand for Chinese items was still very strong, with a pair of Chinese coral ground famille rose vases (FS30/522) exceeding expectations. 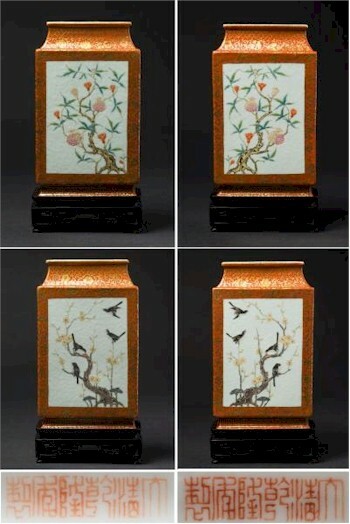 Of slender rectangular section with waisted neck and base, each was finely painted on one side with magpies around a knarled flowering prunus tree and the other with a flowering and fruiting pomegranate tree. 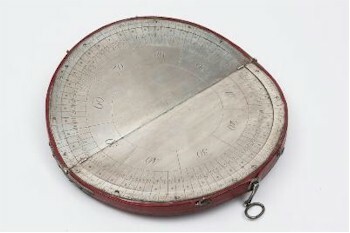 Bearing Qianlong marks and dating from the late 19th/early 20th Century they realised £5,200. 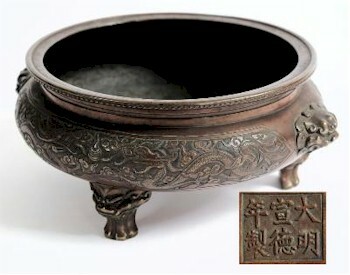 A Chinese bronze tripod censer (FS30/615) bearing six character mark also sold well at £5,000. The Chinese coral ground famille rose vases (FD30/522) sold well above estimate at £5,200. This Chinese Bronze Tripod Censer (FS30/615) succombed to a bid of £5,000. In the works of art auction of the sale, a rare late 18th/early 19th Century cryptograph folding cipher machine (FS30/719) again exceeded expectations selling for £4,800 and an unusual tavern clock by Jeremiah Day of London (FS30/764) went under the hammer for £4,500. The always popular Louis Vuitton luggage proved no exception with a brown and wood batten, brass and leather bound Louis Vuitton trunk (FS30/921) selling for £2,900. Furniture prices were strong too – an early Victorian oak library bookcase of large size (FS30/881) from the sale of the contents of Feniton Court, Near Honiton in 2005 proved popular selling for £3,600 and a pair of Regency rosewood and brass inlaid rectangular card tables (FS30/848) sold for £3,200. A rare Late 18th /Early 19th Century Cryptograph Folding Cipher Machine (FS30/719) realised £4,800. 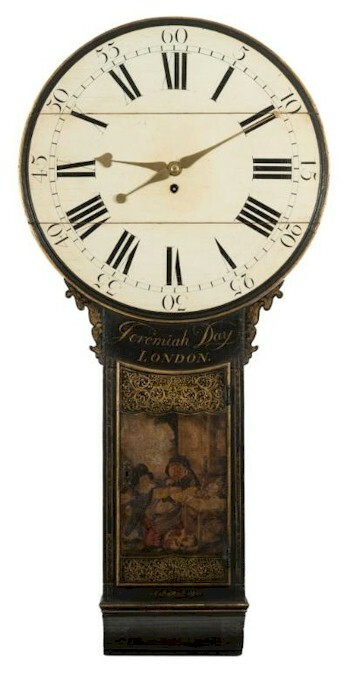 A Lacquered Tavern Clock (FS30/764) by Jeremiah Day of London fetched £4,500. 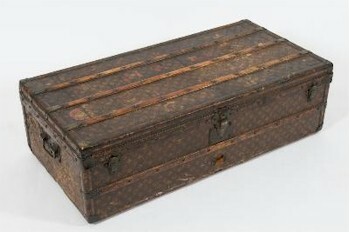 This Louis Vuitton Brown Canvas and Wood Batten, Brass and Leather Bound Rectangular Trunk (No 205236) (FS30/921) exceeded its estimate, selling for £2,900. 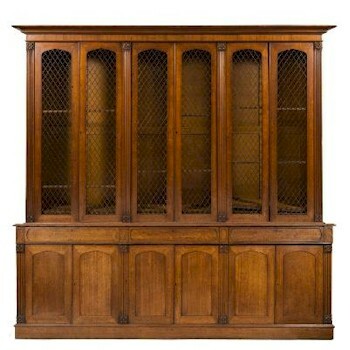 The Early Victorian Oak Library Bookcase (FS30/881) realised £3,600. 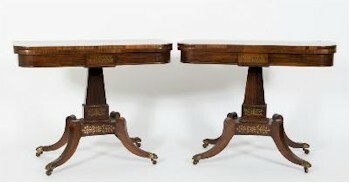 This pair of Regency Rosewood and Brass Inlaid Rectangular Card Tables (FS30/848) sold for £3,200.